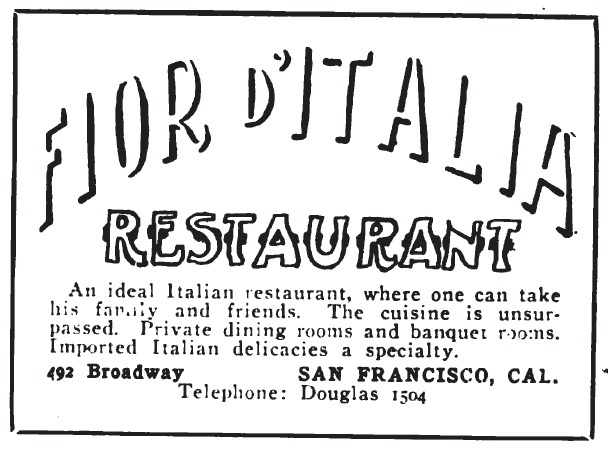 Last week the Fior D'Italia, which opened in 1886, which claimed to be the oldest Italian restaurant in the United States, closed. We had not eaten at the new location at Francisco and Mason. Two of the partners said they may try to open again. The ad is from the April, 1914 Our Navy. Cincinnatus Heine "Joaquin" Miller, "the Poet of the Sierras" was a decent poet and a master of self promotion. John C. Frémont, the Pathfinder, was a US Army officer who led several surveying expeditions across the American west. During the Civil War, he proved to be a poor general. Albert Bierstadt was a German-born painter. I do not know if his painting of the Golden Gate survives. There is a Castle Rock Regional Recreation Area in Walnut Creek, but Castle Rock is a very common geographic name. Update 30-May-2012: Friends suggest that the "Fremont road" from Berkeley to Mills College may be Grizzly Peak Road. It looks good to me. From the 16-August-1896 San Francisco Call. The glory of the Golden Gate speaks forever for itself. Yet how few now living in these headlong days know the story of its discovery and name. Nine men in ten will tell you, even here as they look out upon the great ocean through the gate that it was named by the Argonauts and that the name was born of the golden fleece. But the simple truth is John C. Fremont gave it that name years before gold was found. The bay of San Francisco is separated from the sea by low mountains. Looking from the peaks of the Sierra Nevada the coast mountains present an apparently continuous line, with only a single gap, resembling a mountain pass. This is the entrance to the great bay and is the only water communication from the coast to the interior country. Approaching from the sea the coast presents a bold outline. On the south the bordering mountains come down in a narrow ridge of broken hills, terminating in a precipitous point, against which the sea breaks heavily. On the northern side the mountain presents a bold promontory, rising in a few miles to a height of two or three thousand feet. Between these points is the strait —- about one mile broad in the narrowest part and five miles long from the sea to the bay. Passing through this gate (called Chryspolae on the map on the same principle that the harbor of Byzantium (Constantinople afterward) was called Chryoceras (Golden Horn). The form of the harbor and its advantages for commerce, and that before it became an entrepot of Eastern commerce, suggested the name to the Greek founders of Byzantium. The form of the entrance into the bay of San Francisco, and its advantages for commerce, Asiatic inclusive, suggests the name which is given to this entrance), the bay opens to the right and left, extending in each direction about thirty-five miles, having a total length of more than seventy and a coast of about 275 miles. Within the view presented is of a mountainous country the bay resembling an interior lake of deep water lying between parallel ranges of mountains. * * * Directly fronting the entrance, mountains, a few miles from the shore, rise about 2000 feet above the water, crowned by a forest of the lofty cypress, which is visible from the sea, and makes a conspicuous landmark for vessels entering the bay. Behind, the rugged peak of Mount Diablo, nearly 4000 feet high (3770), overlooks the surrounding country of the bay and San Joaquin. The Fremont road, that bends above Oakland from Berkeley to Mills Seminary, after being closed for half a century, is once more open. You want to see San Francisco? Well, you must go over to Oakland to see San Francisco. And do you want to see Oakland and San Francisco and the bay of all bays on the globe and the Golden Gate at a glance and all together? Then you must go two miles to the northeast and one mile perpendicular. In short, you must climb to the once famous Fremont road and to the camp where Fremont tented half a century ago and from which spot he named the now famous Golden Gate years before gold was found. And now please let me tell you how to get there. Mrs. Fremont, as before noted, confirms and locates beyond doubt the spot from which California's first Senator looked upon this marvel of nature in all its gorgeous magnificence and gave this opulent and color-crowned name to our doorway. It is a bit remarkable that the bay of San Francisco was discovered by land. It is none the less noticeable that the Golden Gate was named, not by any navigator or voyager by sea, but from the solid land, by a man who bore the dust of 3000 miles of wilderness and desert on his leathern garments. The first question asked by the novice in roadcraft and camp life is, "Why did Fremont and Kit Carson keep along these rugged Contra Costa steeps instead of the level valley?'' Water. The one and only answer is, water. In all the broad levels from San Pablo Bay to the pleasant brooks of old San Jose Mission, there was not a drop of fresh water at certain seasons of the year. True, there were vast herds of cattle here when Fremont came, but these cattle had to take to the foothills for water in tbe aiid months of August and September. General Beale, afterward our Minister to Austria, but "Midshipman Beale" at the time, as Fremont calls him in his early reports of his explorations, speaks of killing "Spanish elk" for supplies from his boat on San Pablo Bay, but these cattle watered from the hills. Of course, boats plied, at long periods, up and down the Sacramento from New Helvetia (Sacramento) to Yerba Buena (San Francisco), but no travel passed up and down the river bank; that way was not only impassable by water, but perilous from savages and lawless Mexicans. One of the most pathetic chapters in our naval history is the loss of a ship's boat and its entire crew in passing between these two points. 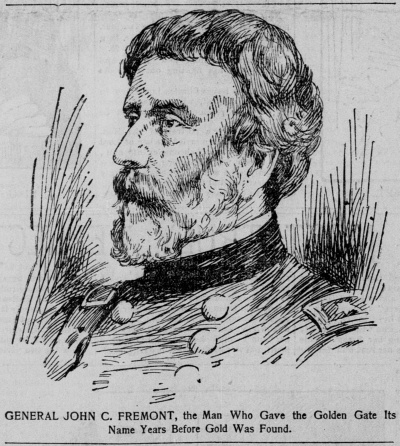 Fremont had, as an army officer, procured from a man-of-war a large sum of money with which to pay his men at Sutter's Fort. The naval commander dispatched his boat with the money in charge of two of his officers and a picked crew to Fremont by way of the Sacramento River. Neither boat, men nor money was ever heard of any more. The names of the officers and marines were carried forward on the payroll for ten years, but no tidings of any sort ever came, and at the end of that time they were given up as lost. Probably a sudden squall and the boatload of silver and the brave men are still together in the bottom of San Pablo or the Carquinez Straits; for it is not recorded in all our naval or military history that any officer ever betrayed such a trust. But such dalliance as this with every dramatic story of olden days and there will be no end. We must get on to the Fremont road. The Old Road as It Appeared In 1854. I first passed over this road in tbe fall of 1854, as bellboy and cook along with Mountain Jo, one of Fremont's former men, who was driving a band of half-wild horses from Southern to Northern California. The road was not in his line of travel, but there were two things almost indispensable to Mountain Jo and his horses, whisky and water. My duties were to ride an old bell mule in the lead of his band of wild horses and wilder Mexicans and look out for "wood, water and grass," and there pitch camp. Jo could find the whisky without any help from his "roustabout boy." My recollection of the road, after breaking camp at the "Embarcadero," near what is now the new pier of F. M. Smith's narrow-gauge Walnut Creek railroad, is mainly of the beautiful wooded and watered Jack Hays Canyon. I think it was then called Temescal. Now and then there were peeps through the pines and red woods as the dusty trail rose and fell up and down the billowy but ever ascending foothills. The trail was knee-deep in dust; and wild oats, rusty, dusty and golden green, rose on either side to my shoulders as I climbed and climbed. Great long ox teams now and then covered the trail, plodding sleepily down toward what is now Oakland, and then we came to a little steam sawmill, and a young man by the name of Moody had charge of the camp. He is now president of the First National Bank in Oakland. We spent the night here, the Mexicans and the cook. Jo did not come up till morning. Here we struck a great wagon road. It was belly-deep with dust in some places. As we went up the precipitous hill before coming to what is now the Redwood road, we met Immigrants with trees tied to their wagons to keep them from pushing too hard on their poor starved and staggering oxen. This made the dust nearly intolerable and wore the roads into deep ruts that may be seen to the left of the new road to this day a dozen feet deep. But enough and more than enough of the old days. To get on with the road go to Berkeley first and then go steeply up to the south of the university for ten minutes through the town, a roar of hammers on either hand (for this place is building with marvelous rapidity), and there you strike the university end of the new Fremont road, only now made passable all the way, but far from complete. The other end is in the region of Mills Seminary. The entire trip up and around the new moon that bends about the Contra Costa hills is twenty miles that is from one extreme side of Oakland around and back to the other extreme side. Strangely enough there is no dust as of old. The adobe is packed down and, as a rule, is hard as steel. Wheelmen make the entire circuit. True, the road is a bit billowy as yet, but no fault is found with it. You must not look hard for the first half mile. You might see what you please to call the University of California. It is a monstrosity in burnt mud. Monstrosity on top of monstrosity and a dozen together; the only question is which is the ugliest. Stanford's is built right down on the grass, with no outlook at all, and yet Stanford's is comparatively a bird's nest in an oak, while this is a squirrel's hole in a hillside. And yet magnificent young men house here; the biggest and the best hearts — the heart and the hope of the State. Gazing Down on Cities From Above the Clouds. And now look below! Bowling along over the high billowy Contra Costa foothills you are above the clouds, the cities! The clouds under you to your right are like cotton. There are people who have no sense of color, or contour, or anything else but cents, who will always speak of these mobile and snowy garmentings of mother earth as "fog." Heavens! What fogs envelop so many of us and make as blind, blind, blind! "And God looked upon all that he had made and behold it was very good." What would the world do without clouds? And at no two hours of the day no two minutes, indeed, are the views along here alike. You see the higher streets of San Francisco above the rolling surging sea mist. The great cross of the Lone Mountain Cemetery lifting in grand and solemn loneliness above all things and looking strangely tall and vast. On and on, up and down and yet surely upward you wheel across the billowy lower foothills and then you dip down into the historic ever green and watered Jack Hays canyon. A rich man, founder of the rival Oakland waterworks, houses here. The valley is set with palms, flower-houses and all that goes to make up civilization in a California country seat. The gloomy guns of Alcatraz. Twelve o'clock and not a cloud— not a cloud above or about the peaceful fair visage of beautiful Oakland below you. And yet do not miss the clouds, God's garments' hem. Truly, all that is good or great is veiled, garmented in mist, clouds, mystery. The priest has his sacred place, the house of God has its holy of holies. All things in nature have their mantled mysteries. The little seeds take life in the dark mold; all life begins in secret, silence, majestic mystery, the large solemnity of night. So that if the clouds should close the door below and lock the Golden Gate, even mantle and quite envelop you as you ascend the Fremont Road, as may happen, do not find fault with nature, as so many new people do — New York, Boston people, who can only see "fog" in it all or out of it all. The Spot Where Bierstadt Painted His Famous Picture. After five miles you come in sight of the spot where Bierstadt painted his famous picture of the Golden Gate for Fremont. This was in 1863. Of course, this work was the sensation, in an art way, of the day, and there are still many men and women in San Francisco who crossed the bay and climbed the hills to see the spot from which the Gate was named and to see the artist at work. A mountaineer by nature and trade, I was of those who took a deep interest in the matter. A party of us, toting our blankets on our backs, pitched camp near the site of the little sawmill before mentioned. We camped about a week here, living mainly by hunting. One day (this was after Bierstadt and bis friends had all gone away, leaving the place, now a barren sheep ranch quite empty of human life) we found on retiring to camp that our entire stock of bread and bacon had been eaten by wild beasts. A hunting party was organized out of the sheepherders and a few ranchers, and the result was: Two black bears, a California lion and lots of smaller game. "When Bierstadt went to California to study its scenery (and the Rocky Mountains en route) we gave him letters to Starr King and other friends. It was about April of 1863. In giving him a commission to paint for us the Golden Gate, with the setting sun lighting the pathway into it, both of us, Mr. Fremont and myself, gave him fully our feeling. I clearly remember Mr. Fremont saying we must see the sunset from the Contra Costa, as he had to realize the force and splendid appropriateness of the name in its scenic sense, apart' from the other idea of the gateway of commerce. Bierstadt made a grand picture. When we had to sell what would bring needed money Commodore Garrison bought this for $4000, just what we had given Bierstadt. "My daughter, who was from her seventh year a constant companion of her father on long horseback rides and days of working explorations on the Mariposas, as well as many a long ride around San Francisco — as often in quieter times on the Hudson— remembers many and many a talk on views, on physical geography, on beautiful camps, for she has her father's silent delight in nature and is his true child in loving to read of, study and inform herself of geographical travel. She says she feels sure you are right." Here in a saddle of the mountains are many springs, and, being the last fresh waters on the road to the bay below the old camp of Fremont, was a favorite camping spot. This was the famous dueling ground where many deadly encounters were had, the most noted of which was the one when Colonel Woodleaf fell at the hand of young Kewen, brother of the late Congressman Kewen of Los Angeles. Kewen fell with Walker at Rivas, Nicaragua, dying with the same rifle in hand with which he had killed Woodleaf. Where Fremont Stood When He Named the Golden Gate. "The great rock stamps it. He loved a mass of detached rock. * * * When I was written to by a New Yorfc friend of an intended monument to the general I asked that they would spare him the commonplaces that make such sadly mourning-stones usurp our finer ideas. If they must, then put up a great rock, a rough mass of granite, such as he had carved the emblem of the cross upon 'according to the custom of early travelers' — for he felt the strong, invisible power that grasped the heavens and the earth — and on it put only bis name." But the very finest view of the Golden Gate, San Francisco, "The Sleeping Beauty or Tamalpais. Oakland, Alameda, and, in truth, the whole under world of land and water, is from a point still a little further on and across the small bridge here, at a small grove of cypress trees set to mark the favored spot. At morning, noon or night, especially night, when the heavens and the earth are on fire — for you cannot tell where the lights leave off and the stars begin — the scene is the most gorgeously magnificent on all the globe. And the world walks up and down. On the sea of lights far streaming. As it duplicates the world! The finest days here are the stormy or winter days, when there are no forest fires to make a haze and the clouds are at work below in all their mobile and ever-changing glory. Early spring is quite as effective. At that time the clouds are being driven out from the Oregon Edens by the naming swords of approaching summer, and they surge down the coast as if terrified and pour in at the Golden Gate like flying fugitives, the California sun spilling all its golden opulence on this surging, inflowing sea; a ship's masts piercing through, a church spire, the green hills of San Francisco beyond — but how idle are all words here! It is noticeable that at each equinox the sun, from this — Fremont's — point of view, falls down exactly into the Golden Gate, and it is always at such times in credibly vast, blocking for a few moments the whole gate with its disk of gold. I once saw a black cloud— black as midnight and as boundless— hang above this ball of gold as it rolled down into the golden chasm of the Golden Gate. But the sun did not heed the cloud. The cloud was only blacker from the brightness of the golden globe, and the gate and the walls of the gate, and the bay, and the City, and all the cities up and down, and the islands, and the ships, and, indeed, all the world, the heavens and the earth, all things, save tnat awful nightmare of black cloud above the golden sun, were for a moment nothing but molten gold. Then the sun sank, sank suddenly into the sea, as if it had, indeed, been a mighty ball of gold, and the blackness fell down as suddenly in his place, and blackness was only blackness, as if God himself had closed the gate with a bang, and forever. The Poet Completes the Journey Over the Crescent Way. Five miles more of this. Passing to the left, the great track in the old road where immigrants used to let their wagons down by trees, and you climb up and then down to the Redwood road and begin to descend, with Mills Seminary before you. Five miles of levels after this and you enter Alameda, Oakland. This is only an outline, a sort of blazing out of a trail. l am too wise at my trade to attempt the impossible. Chauncey Depew — and who could be better authority? — last spring pronounced the seventeen-mile drive at Monterey the grandest on the globe. But he had not seen this Fremont road. It was not then completed. It is conceded that the Monterey drive is grand, restful, inspiring, and a glory and an honor to the State; but as compared to this new moon that bends above and about Berkeley, Oakland and Alameda, it is but a nursemaid's path for babies' little wagons. On Memorial Day it is fitting and proper to remember the men and women who gave their lives, who continue to give their lives, to give us the country we deserve. 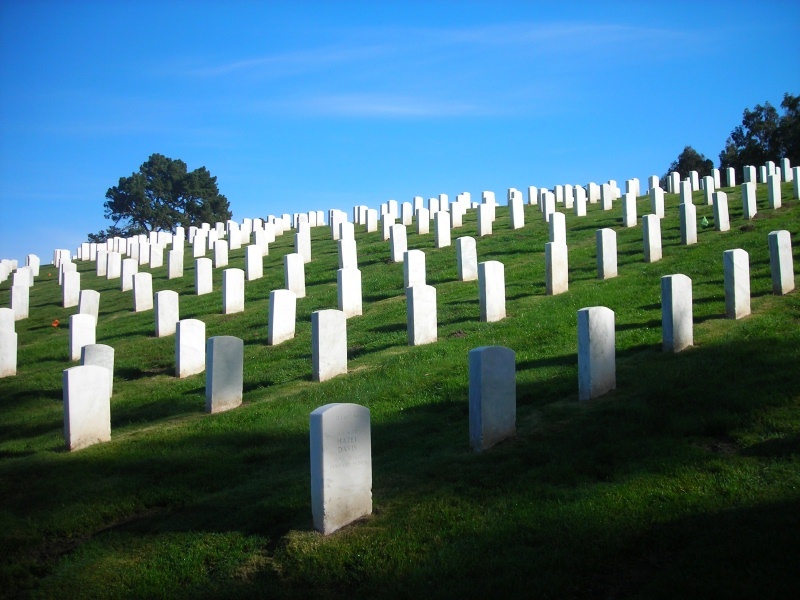 I took this photo on 14-December-2007 at the National Cemetery in the Presidio. 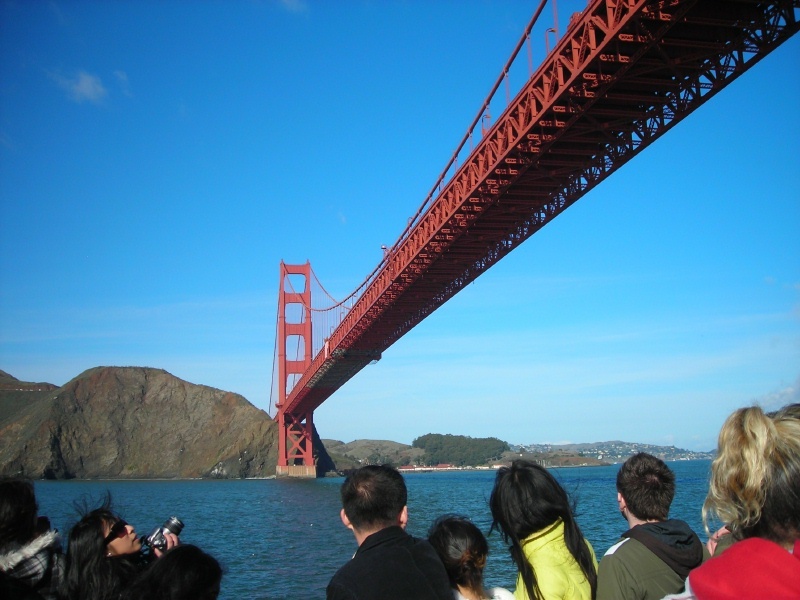 On 25-May-1937, the Golden Gate Bridge opened for a pedestrian day. This weekend and this year several events are marking the bridge's birthday. I'm happy that people are trying to revive the memory of the people who worked with and for Joseph Strauss and who did much of the work to design the bridge, Leon Moisseiff, Charles Ellis and Irving Morrow. Only 11 men died during the building of the bridge from 1933 to 1937; this was an unusually low number for the time, because of a safety net installed by Strauss. On 28-May-1937, the bridge opened to automobiles. I took the photo during a bay cruise on 30-December-2007. Even though the Manila Galleons had sailed down the coast past the entrance to the Golden Gate for 200 years, the first European ship to sail through the Golden Gate into San Francisco Bay was the packet boat San Carlos, commanded by Captain Juan de Ayala, on 05-August-1775. I didn't understand how they could miss it till I went whale watching many years ago and saw how the hills blend together. That in combination with the frequent fog made the Golden Gate difficult to spot. 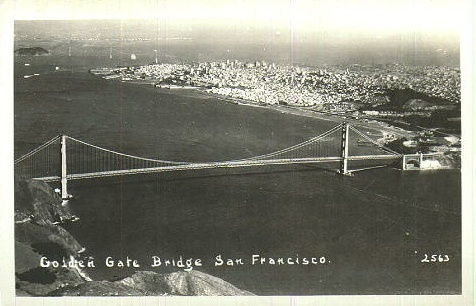 In light of the Golden Gate Bridge's 75th birthday, I thought it would be nice to include an image of the Golden Gate before the bridge was built. The writer may have meant "Argo" instead of "Argos," The Argo was the ship of Jason and the Argonauts. Argos is a city on the Peloponnese in Greece. "The stately ships pass in to the haven under the hill" is a quote from Alfred Lord Tennyson's short poem Break, Break, Break." George Davidson was a scientist a broad range of interests, including geography and astronomy. "La Bonita" does not mean "The Bishop's Bonnet." The point to the north of the Golden Gate is called La Bonita because it is pretty. From the 22-November-1896 San Francisco Call. William A Coulter did many maritime drawings for the newspaper. Click on the image to see a larger version. STORY OF THE SHIP SAN CARLOS. STANDING above the Golden Gate where "The stately ships pass in to the haven under the hill," one asks where is the pioneer — the Argos — the ocean pathfinder of the navies that have come and gone through that narrow water way for over a century? The flotillas of the world has harbored in the peaceful bays of Yerba Buena, but in what eternal anchorage has moored the leader of the fleet? From the manuscripts of Professor George Davidson it is learned that in the early part of the year 1775 a number of vessels left San Blas for exploration on the coast of Alta California. One was the San Carlos, better known as the Toyson de Oro (Fleece of Gold), and under the command of Juan Bautisla Ayala. She sailed the farthest north to survey the port of San Francisco, discovered by Portala (Portola - JT) six years before. On August 5 she arrived off the entrance to a beautiful, almost landlocked bay which they could see in between the headlands. The launch was lowered into the water and a crew sent away to examine the approach to the harbor. They were gone all the afternoon. and soon after nightfall, the moon making everything around almost as plain as day and the light breeze blowing directly in-shore, the San Carlos sailed through the Golden Gate and dropped her anchor off what is now the Presidio. It is interesting to read a paragraph from the ship's log, as it were, on that first night in San Francisco Bay, written by Professor Davidson 121 years after: "The sun set at 7.05 local mean time, and the moon at twenty-seven minutes after midnight; the prevailing westerly winds blew strongly in through the harbor headlands; the high water was at 6.23 in the evening and was 4.5 feet above low-water plane; low water at 11:36 a. m., high water again at 6:09 p. m., five feet above low water plane." The launch returned to the ship next morning, the exploring party in her having camped on the shore of Carmelita Bay -— the Sausalito of to-day. The San Carlos then hove up her anchor and found good moorings between the highlands and an island which Captain Bautista de Ayala called La Isla de Nuestra Senora de los Angeles, a name later considerably shortened down to Angel Island. The officers of the vessel surveyed the "Grand Estero" of Yerba Buena, and the San Carlos returned to Monterey about October 1. "By your official letter of the 24th inst., which I received yesterday evening, I am advised of the misfortune which happened to the 'paquebot' San Carlos on the 23d inst., which, having made sail for this port, on account of the roughness of the weather, the dullness of the vessel and the insufficiency of the crew, was driven upon a rock lying directly under La Bonita, the shock so injuring the vessel that, if the wind and tide had not favored them, all hands would have perished, but finally they reached Yerba Buena and made a landing at a point to which the vessel was carried by the wind and tide." "This landing," says Professor Davidson, "was doubtless under Clarks Point, near the northern end of Battery street, and here General Vallejo says a sunken wreck was pointed out to him in 1829 as being the wreck of the San Augustin, which, he has erroneously stated, was wrecked near Tomales Bay in 1595, and subsequently drifted from that place into San Francisco Bay. As no other vessel was sunk in this vicinity before Vallejo saw the wreck, we may safely conclude that it was the remains of the San Carlos which were pointed out to him." Hence from such eminent authority as that of Professor Davidson it may be believed that the storied San Carlos finally laid her bones to rest on the shores of the noble sheet of inland sea she first sailed over. Jason's classical craft, after her memorable voyage in search of the Golden Fleece, was hoisted up to the stars, and in the constellation of Argo Navis she sails in the glory of the celestial seas. But this more real and more modern Argos, called — strangely — the "Fleece of Gold" (Toyson de Oro), after leading the way to a shore more valuable than Jason and his argonauts ever dreamed, was left to rot under the wharves of the bay she found. Following the San Carlos came the trader and the whaler, gathering the products of the new shore and sea. Presently the mountains began to unlock their treasure troves, and a gleam more golden than ever came from the cavern of a genie flashed across the continent. Then the ships failed in between the headlands of the "Bishop's Bonnet" (La Bonita) on the north and the Point of Wolves (Lobos) on the south. In all shapes and conditions they crowded through in the wake of the pathfinder — the ship strangely and fittingly known as the "Fleece of Gold." Around the stormy Horn they labored and from the Russian possessions near the Arctic they steered for the port of El Dorado. Even across the Pacific from the walled in Orient drifted the craft of the East freighted with eager seekers after the wealth lying hidden away behind the Coast Range. It was a mighty assembly that fleet, but the great bay among the hills could hold them all and the wide-open harbor door welcomed the squadron in. Following the fierce hunters of the mountain treasure came the quieter inhabitants of the valleys — the people who delved in the soil, not for the golden ore but for the fertility that brought forth the golden harvest of corn. Then the sheaves lay like manna on the slopes and the wheat ships gathered in the bay. The products of vineyard and field piled upon the wharves along with the output of the mine, and the grain, the grape and the gold of the new empire in the sunset poured into the vessels that followed the San Carlos into the harbor beyond the two frowning headlands. Such is the story of the new Argos -— the ship of the "Golden Fleece" -— so aptly named, that opened the western gate of the New World and was left to rot on the shores of the harbor she found, as told in the old dusty Spanish archives of the dim long ago. 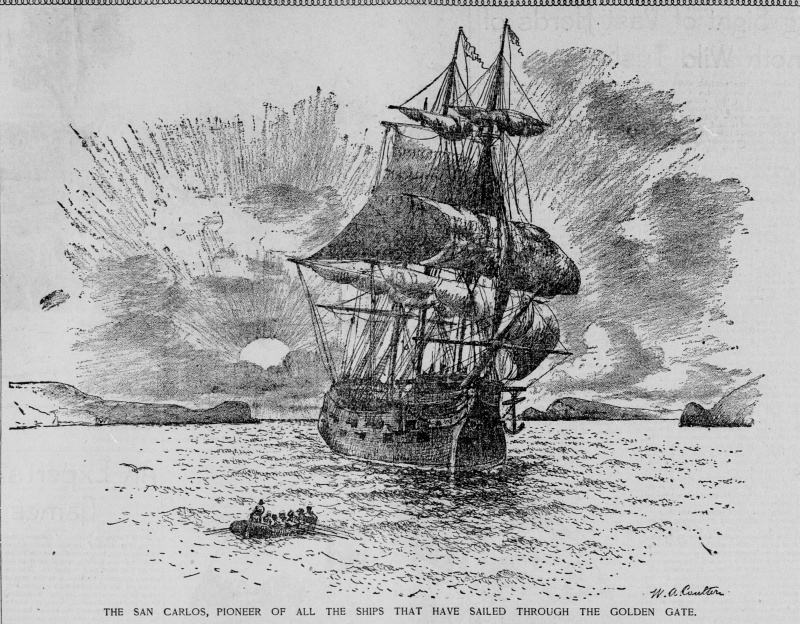 The splendid picture that accompanies this article was drawn by W. A. Coulter, the well-known marine artist, from a sketch of the San Carlos made by Fra Vicente Maria, the chaplain of the vessel who was one of her complement on her entrance into San Francisco Bay. It is an accurate representation of the high stem and high stern ships 121 years ago. She was a man-of-war, as the guns that look frowningly from her rounded sides testify; and the boom of that battery was the first warlike sound that rang over the blue waters of Yerba Buena. 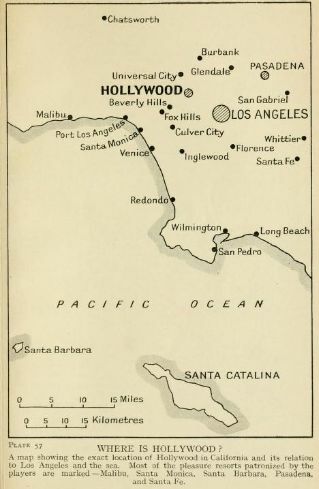 It is the intention to give in the columns of The Sunday Call a series of articles, illustrated by Mr. Coulter, describing the different types of ships that have rendezvoused in this harbor since the San Carlos came in that calm, moonlit evening long ago. No port in the world can show such a cosmopolitan fleet. The sail of the north and the south, the east and the west find a safe haven here. Verily, a mighty queen sits by the "grand estero" lying within the Golden Gate. I took the photo on 02-May-2012. 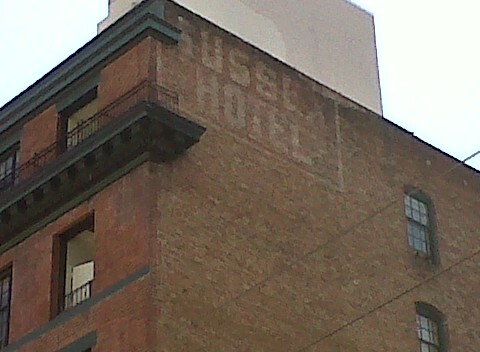 The former (I think) Sussex Hotel stands at Sutter and Taylor Streets in San Francisco. There is a Subway Sandwich shop on the ground floor and a For Sale sign on the wall. 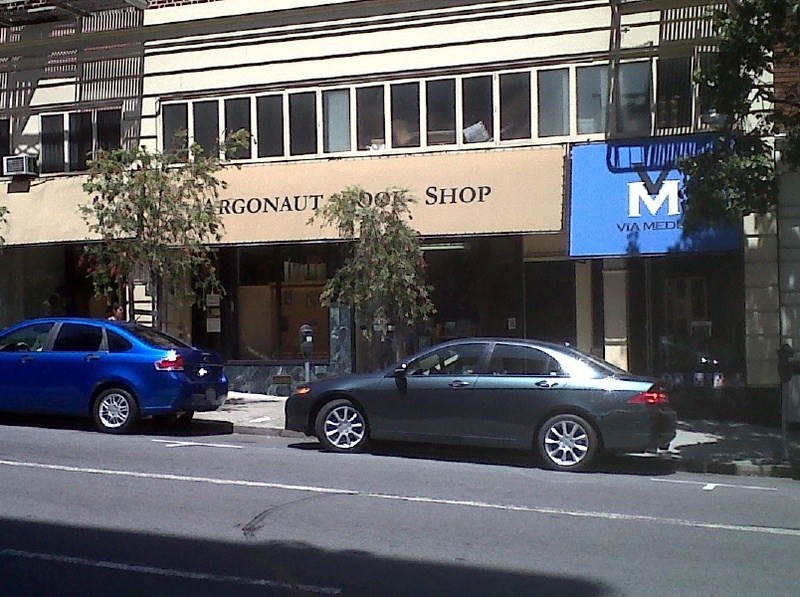 The door is hardly visible, but I had to include this shot of the Argonaut Book Shop on Sutter Street. In Alfred Hitchcock's Vertigo, Barbara Bel Geddes takes Jimmy Stewart to the Argosy Book Shop to learn about the history of Carlotta. The Argosy was inspired by the Argonaut, which used to be on California Street. 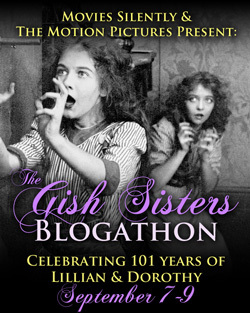 This post was too late for the blogathon, but please feel free to use the link to contribute. Thank you to Ferdy on Films (http://www.ferdyonfilms.com/), The Self-Styled Siren (http://selfstyledsiren.blogspot.com/) and This Island Rod (http://thisislandrod.blogspot.com/) for organizing this year's blogathon. 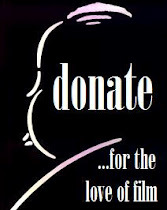 Please consider donating to the National Film Preservation Foundation. 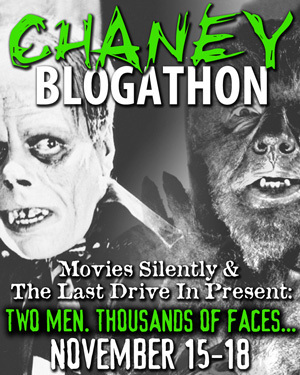 For the Love of Film III is raising money to place The White Shadow, a 1923 Graham Cutts movie on which Alfred Hitchcock served as assistant director, on the internet for free viewing. Bill "Count" Basie was one of the greatest piano players and bandleaders in 20th Century American music. He began playing the piano in his native New Jersey. He moved to Harlem and met many important musicians including Fats Waller and Willy the Lion Smith. He became the pianist for Walter Page's Blue Devils, a territory band that worked out of Kansas City. He moved on to Benny Moten's band, which dominated Kansas City. 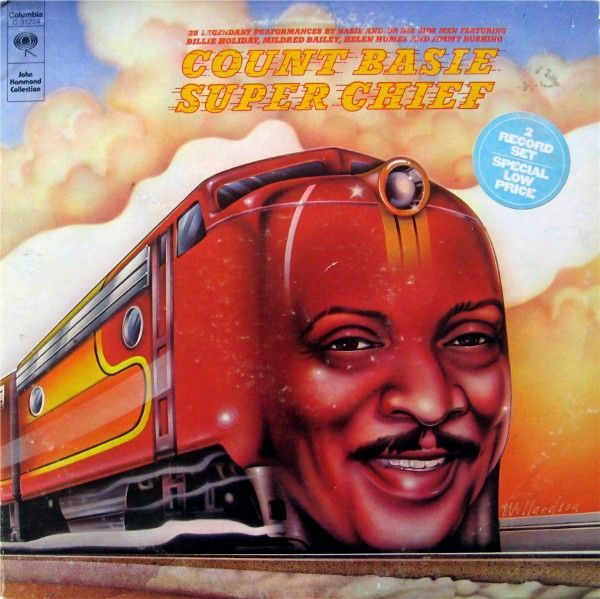 After Moten died, Basie formed a new band, which was one of the best swing bands. He featured Lester Young, Ben Webster, Freddie Greene, Buck Clayton, Jo Jones and many more. 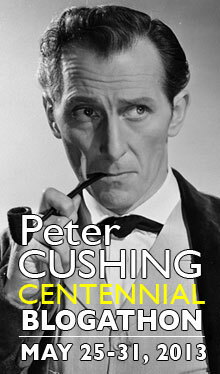 "Count" was a sign of his important place in the aristocracy of music. He even appeared in Blazing Saddles. In Alfred Hitchcock's Vertigo, Jimmy Stewart playing, a former police detective, follows Kim Novak, playing the wife of an old school friend of Stewart's, into an alley. She parks her car and enters a nondescript door. 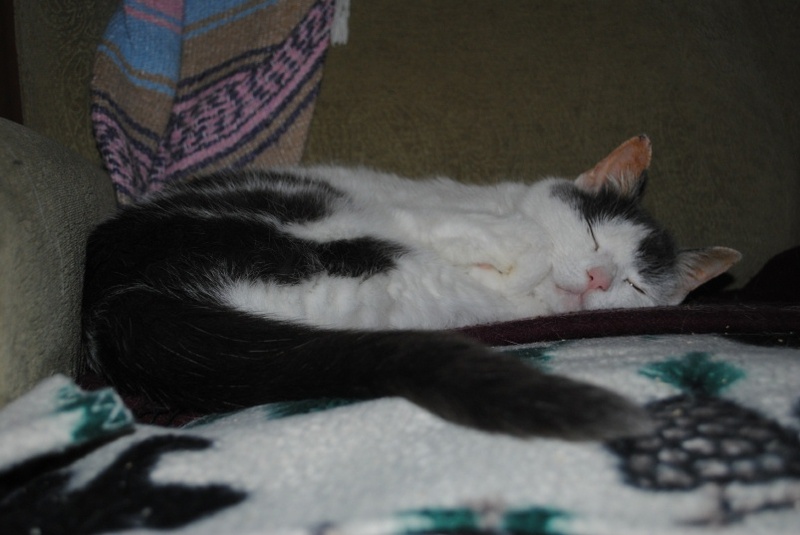 Stewart follows her and winds up in a dirty-looking room. He looks through a door and sees her in a beautiful flower shop with a distinctive tiled floor. This was Podesta Baldocchi, an old San Francisco florist. The shop on the left used to be the home of Podesta Baldocchi. The alley, a short extension of Campton Place, has been closed off with a gate for several years. I suspect the owners of the shop got tired of Hitchcock fans. Ironically, this alley was only used for a couple of shots looking back towards Grant Avenue. Hitchock needed an alley that was open at both ends, rather than one that dead-ends like this. 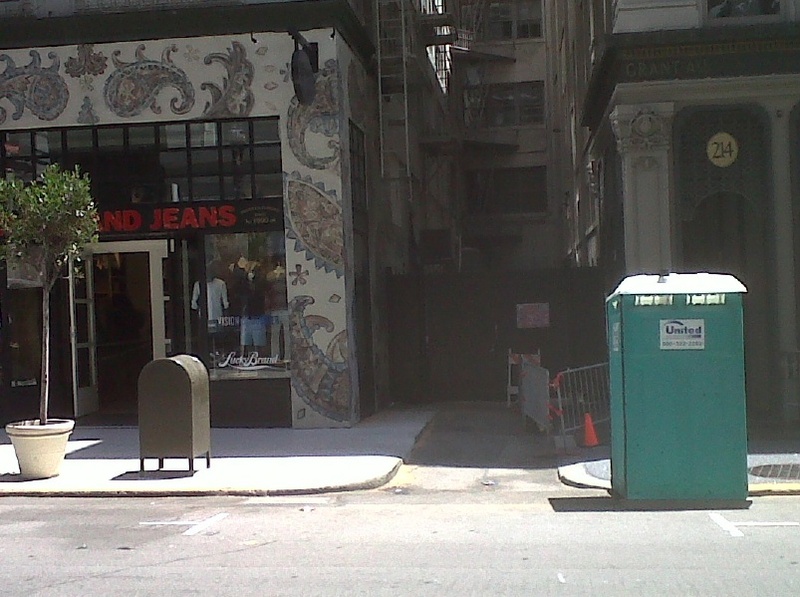 Most of the shots and the door were filmed in nearby Claude Lane, which goes all the way through the block between Bush and Sutter. The 75th anniversary of the opening of the Golden Gate Bridge comes next week. The Chronicle had a special section today. I went to the Hyatt Garden Hotel in Foster City to speak to the Daughters of the American Revolution. 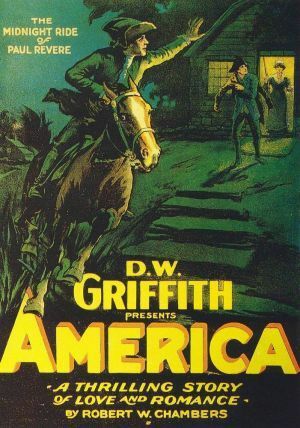 After lunch, I talked about DW Griffith, his movie America and the poor performance of movies about the Revolution. I had fun. Some of them had opinions about why they don't make many movies about the Revolution and why many of them do poorly at the box office. This post is part of For the Love of Hitchcock, The Film Preservation Blogathon, hosted again this year by Ferdy on Films (http://www.ferdyonfilms.com/ -- Sunday, Monday) and The Self-Styled Siren (http://selfstyledsiren.blogspot.com/ -- Tuesday, Wednesday), along with Rod of This Island Rod (http://thisislandrod.blogspot.com/ Thursday, Friday). Click on images to see larger versions. 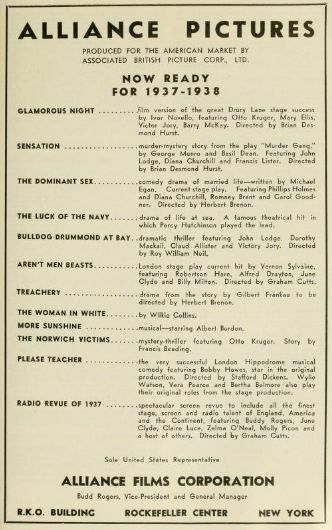 The image at the top of the page is a full-page ad from The 1963 Film Daily Year Book of Motion Pictures. 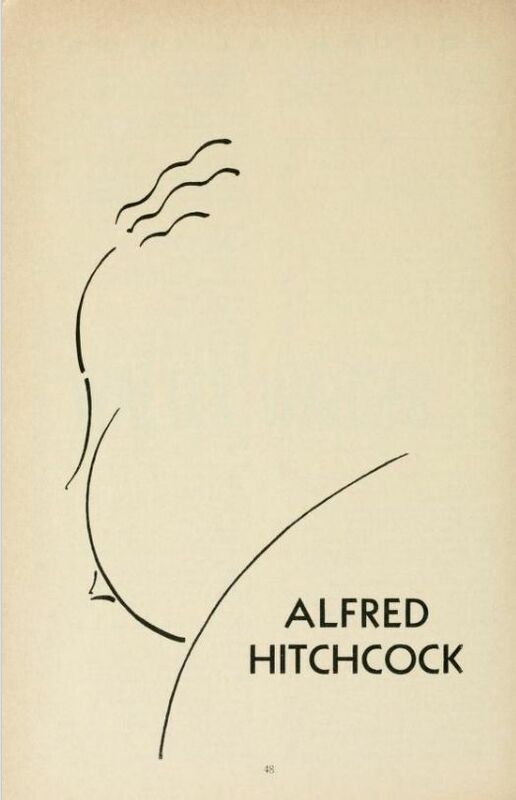 Alfred Hitchcock was a rare creative artist in the movie business, but he had to function within the studio system for most of his career. I wanted to document the way he fit in. 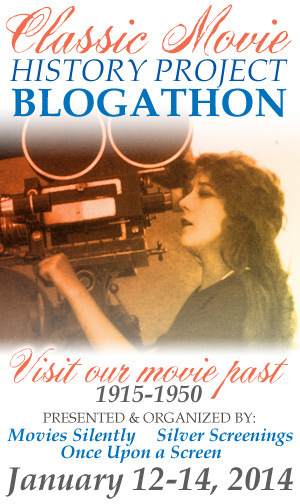 For this installment of the blogathon, I went through the 1933 World Film Encyclopedia, a British publication edited by Clarence Winchester. Many industries publish annual books which describe the people who work in them and what they have accomplished. In the film industry, this was a useful way to determine whether someone who said he had worked for DW Griffth or CB DeMille really had. Some of these yearbooks and many other valuable resources are available in the Media History Digital Library (http://mediahistoryproject.org/). Most sources say Hitchcock was born in 1899. Graham Cutts directed the movie we are raising funds for, The White Shadow, and Woman to Woman. Hitchcock performed many tasks for both productions. He also directed The Sign of Four, starring Arthur Wontner as Sherlock Holmes. Betty Compson, an American actress, starred in Woman to Woman and The White Shadow. Robert Irvine's biographical sketch says he was discovered by Hitchcock. Phyllis Konstam's entry says Hitchcock spotted her as an extra in Champagne and gave her a part in Murder. John Longden was the leading man in Hitchcock's Blackmail. He also appeared in The Skin Game and Juno and the Paycock. 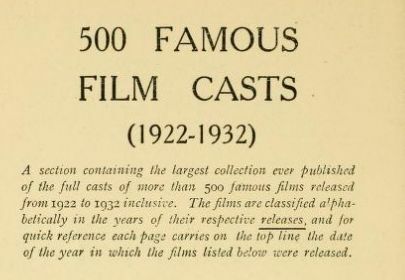 "500 Famous Film Casts" does indeed list 500 movies and their casts. Some Hitchcock films made the list. Graham Cutts directed Woman to Woman. Alma Reville edited. Hitchcock wrote the script and served as art director and assistant director and met Alma Reville. 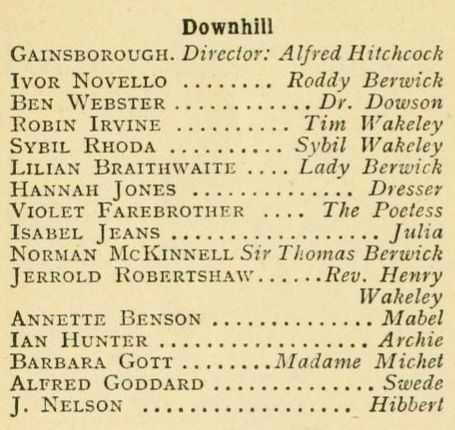 Downhill was a silent, one of several films Ivor Novello did with Hitchcock. 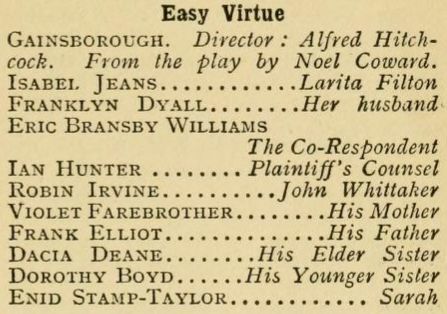 Easy Virtue was another silent. 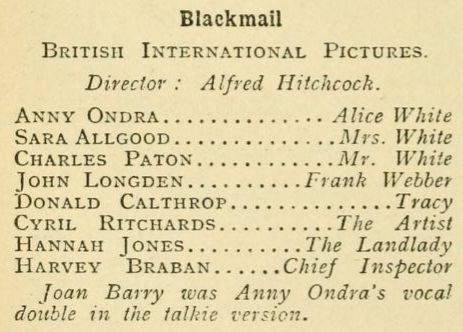 Blackmail was the first British all-talkie. It was shot as a silent and then mostly reshot. Leading lady Anny Ondra's accent was impossible, although there is a test reel of her talking to Hitchcock, so her lines were spoken off screen by Joan Barry. Murder, sometimes Murder!, was a rare Hitchcock whodunnit. 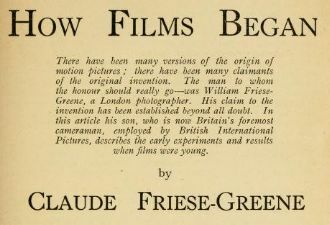 The encyclopedia includes many interesting articles, such as "How Films Began" by Claude Friese-Greene, sone of William Friese-Greene, a pioneering experimenter and subject of the inaccurate biopic The Magic Box. 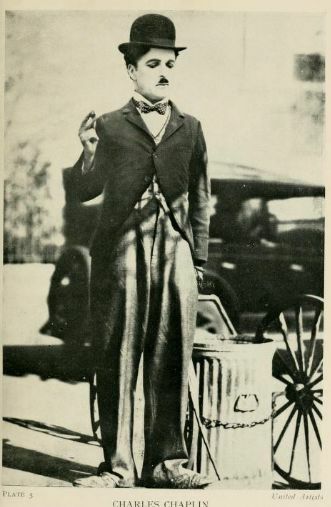 There are images of several famous actors, including this one of Charlie Chaplin in what appears to be a scene from City Lights. 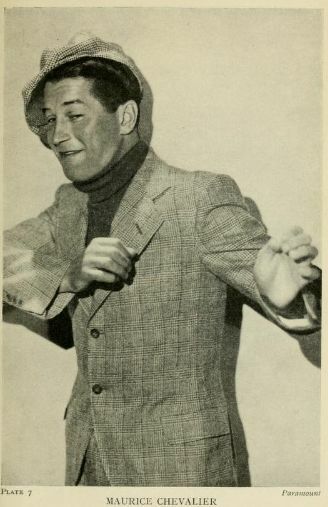 Maurice Chevalier has always been a favorite of mine. 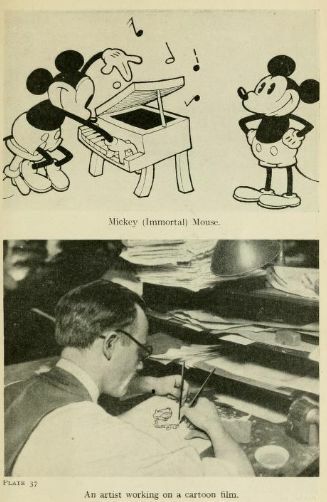 Mickey Mouse and an animator at work. 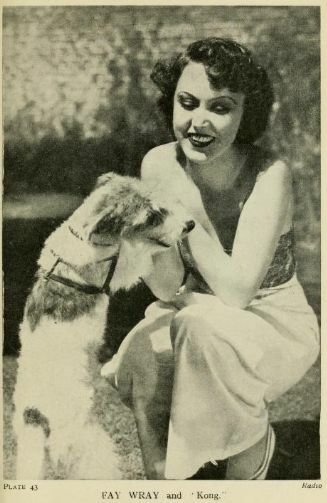 I did not know that Fay Wray had a dog named Kong. 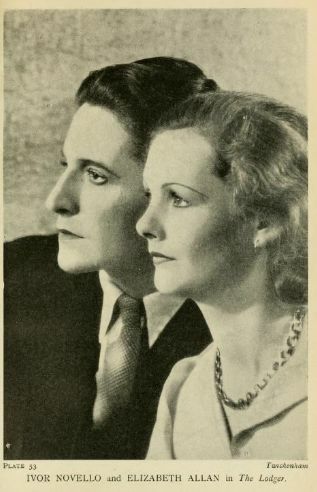 Ivor Novello, actor, singer and songwriter, appeared in The Lodger and Downhill for Hitchcock. Elizabeth Allan did not appear in The Lodger. A map shows the location of Hollwood. 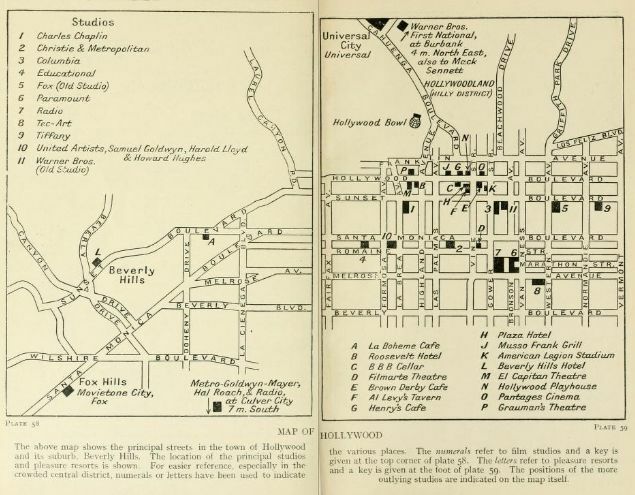 Another map shows the locations of studios in Hollywood. 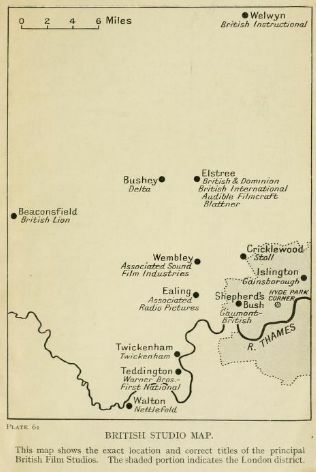 This map shows the locations of studios in Britain. Thank you to Ferdy on Films (http://www.ferdyonfilms.com/), The Self-Styled Siren (http://selfstyledsiren.blogspot.com/) and This Island Rod (http://thisislandrod.blogspot.com/) for organizing this blogathon. I'm having fun and learning. Alfred Hitchcock was a rare creative artist in the movie business, but he had to function within the studio system for most of his career. I wanted to document the way he fit in. 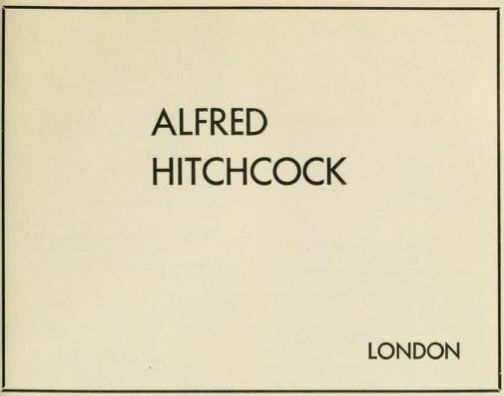 For this installment of the blogathon, I went through several yearbooks from the 1920s and 1930s and dug up some interesting references to Hitchcock. 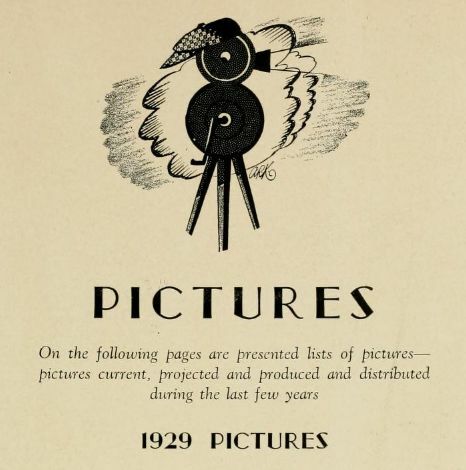 The Film Daily, "The Daily Newspaper of Motion Pictures," a major source of news for the film industry, also published a yearbook starting around 1918. 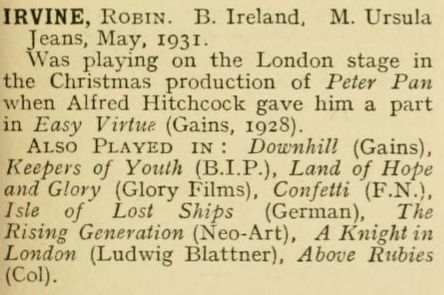 The 1927 edition of the Film Daily Yearbook lists Hitchcock's first two directorial credits, The Pleasure Garden and the Mountain Eagle. 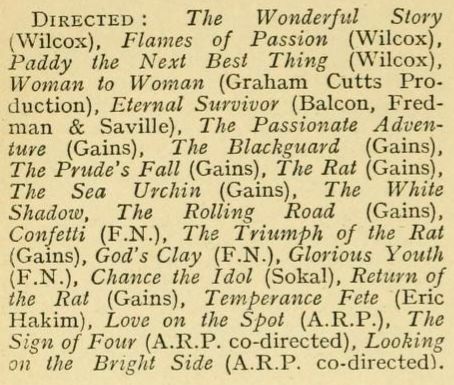 The 1927 edition also lists Hitchcock's writing credit on the Graham Cutts movie Woman to Woman. 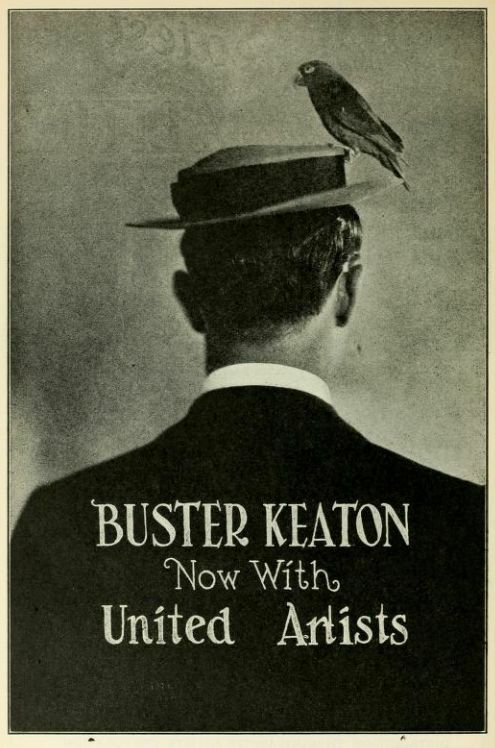 I felt compelled to include this wonderful full-page ad for Buster Keaton. 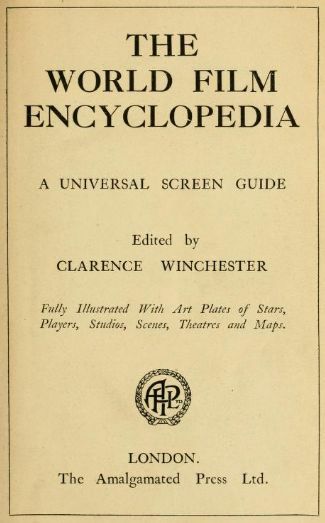 The 1929 Motion Picture Almanac was published by The Exhibitors Herald-World. 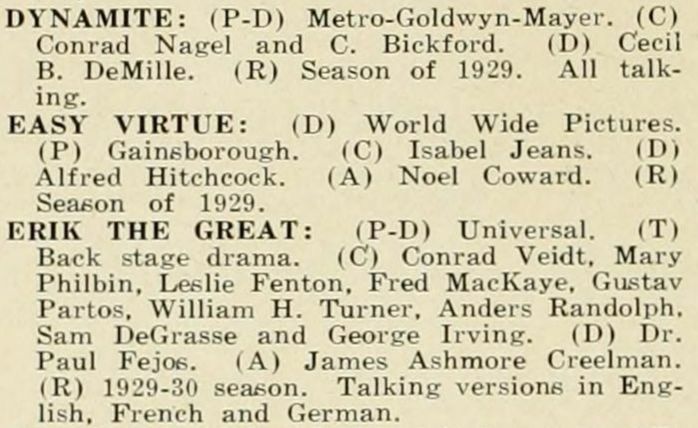 Hitchcock's Easy Virtue is listed right after C B De Mille's Dynamite. Hitchcock's The Ring is listed with a couple of movies I have never heard of. 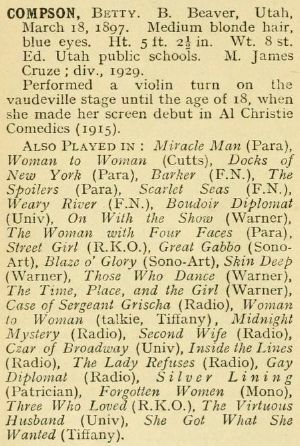 Motion Picture News was a trade paper that merged with The Exhibitors Herald-World to form The Motion Picture Herald in 1930. 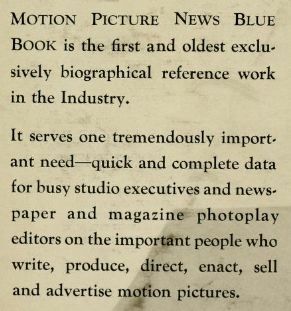 As described above in the 1929 edition, the Motion Picture News Blue Book was a collection of biographical information about people in the industry. This edition also included some interesting ads. 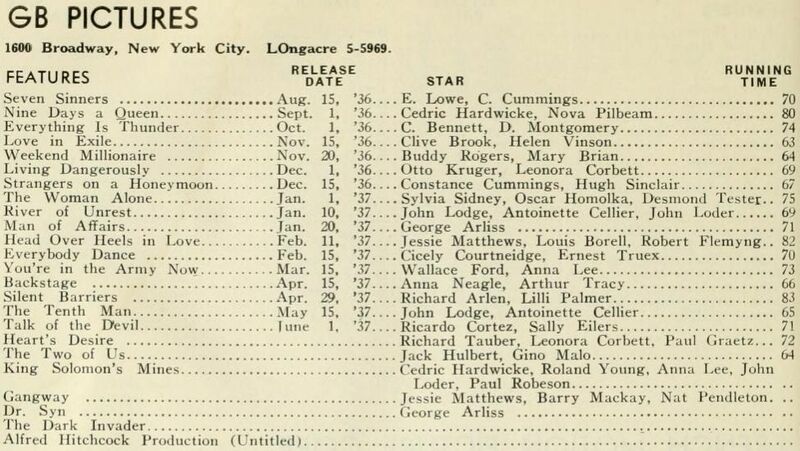 Hitchcock's entry leaves out his earliest movies. 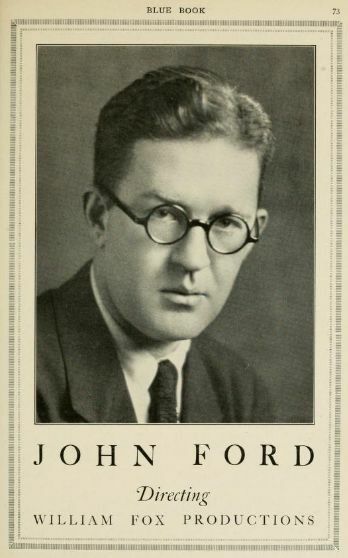 John Ford, the smiling Irishman. 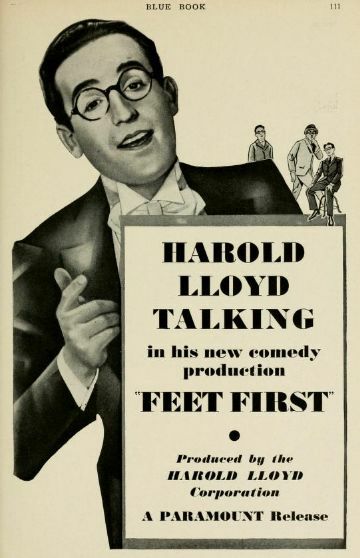 Harold Lloyd looks as if he is singing in this ad for his second talkie, Feet First. 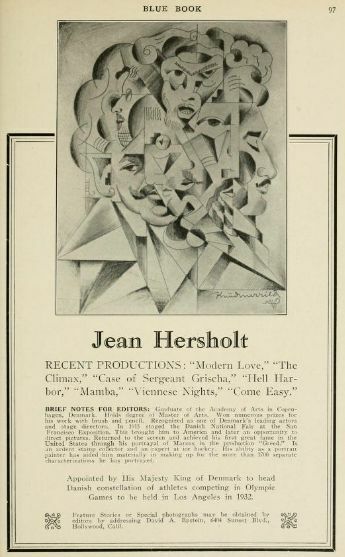 Jean Hersholt's ad has the most interesting portrait. I cannot make out the artist's signature. "Appointed by His Majesty King of Denmark to head Danish constellation of athletes competing in Olympic Games to be held in Los Angeles in 1932." 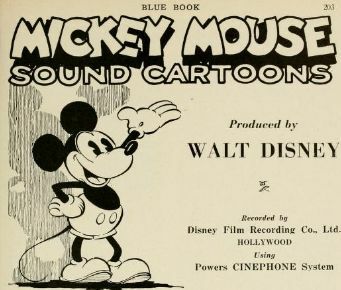 The ad for Mickey Mouse Sound Cartoons mentions that Disney was still using the Powers Cinephone system. Someone should write a book about Pat Powers. 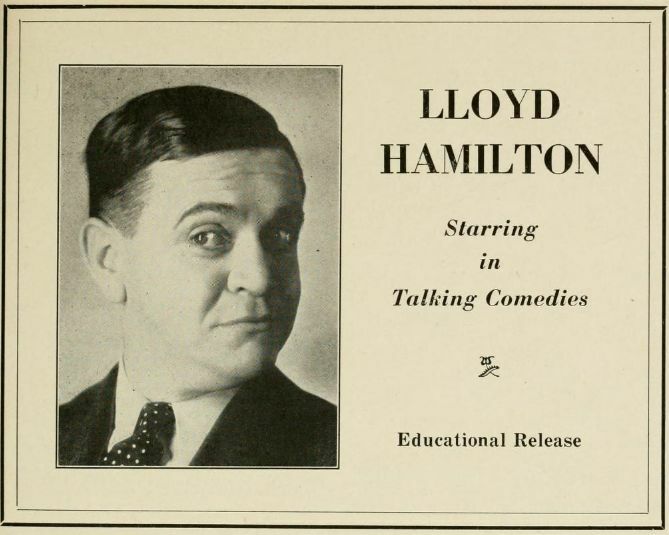 Lloyd Hamilton was appearing in sound comedies for Educational. 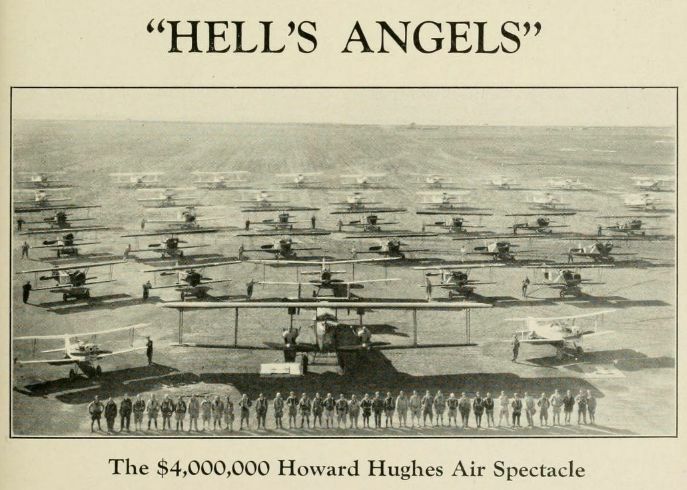 Howard Hughes was promoting Hell's Angels. 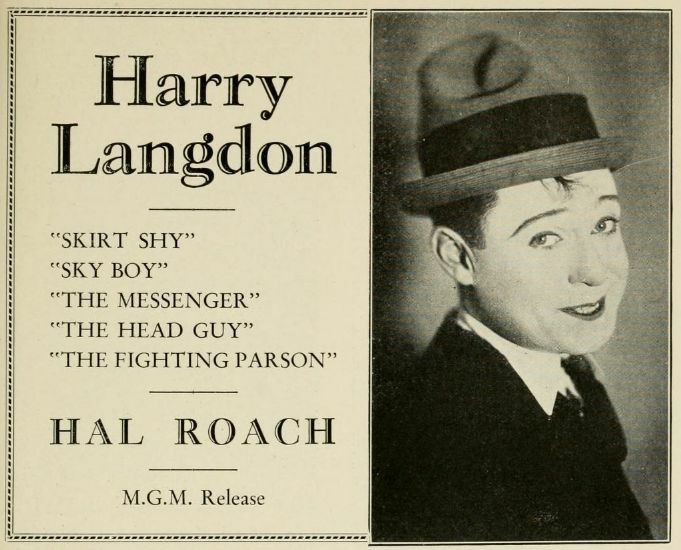 Harry Langdon was working for Hal Roach. 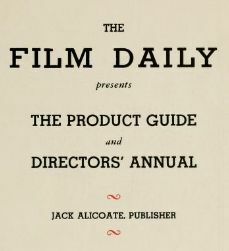 The Film Daily Product Guide and Directors' Annual was a mid-year supplement to the Film Daily Yearbook. 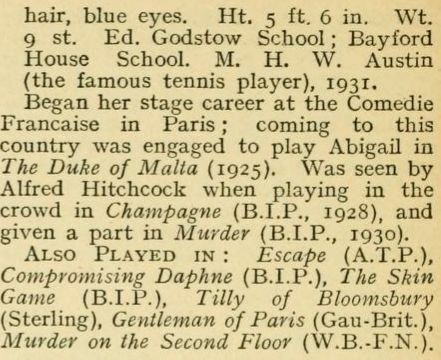 Hitchcock's biographical entry has his year of birth wrong. It should be 1899. The only Hitchcock production listed is The Woman Alone. This was based on Joseph Conrad's The Secret Agent and released in Britain as Sabotage. The Woman Alone was the title for it's initial release in the US. It was reissued in the US as I Married a Murderer. Hitchcock complicated matters further by releasing a movie called The Secret Agent, which was based on a story by W Somerset Maugham. 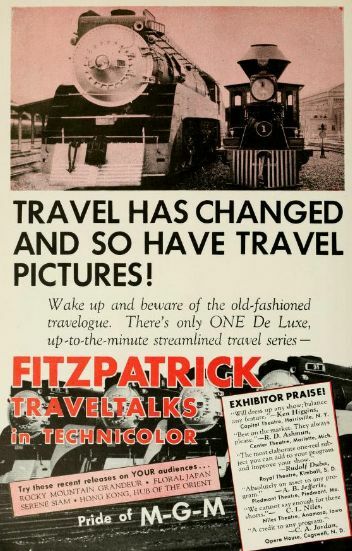 As a railfan, I had to include this ad for the Fitzpatrick Traveltalks, which turn up frequently on TCM. It features a Southern Pacific GS (Golden State) 4-8-4, in Coast Daylight colors, which is posting next to Central Pacific locomotive 1, the C P Huntington, a unique 1863 4-2-0T which is preserved at the California State Railroad Museum (http://www.csrmf.org/). 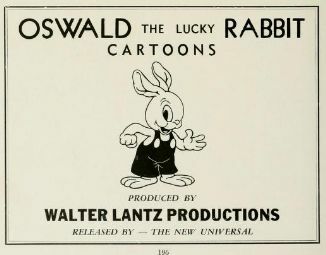 Oswald the Lucky Rabbit was stolen from Walt Disney. The Disney corporation recently got him back. 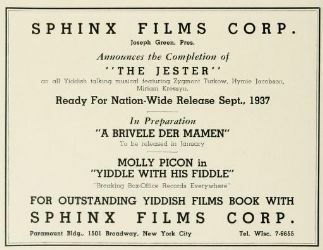 Sphinx Films Corporation produced Yiddish-language movies, including the famous "Yiddle With His Fiddle," starring Molly Picon. 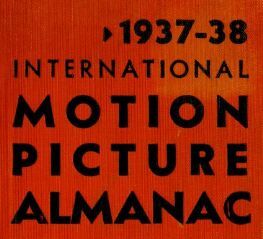 The 1937-1938 edition of the International Motion Picture Almanac was edited by Terry Ramsaye, who had published A Million And One Nights: A History of the Motion Picture Through 1925, a pioneering book about cinema. Cameraman John Cox had worked on five Hitchcock movies, including The Ring and Blackmail. Edgar Clarence was "(i)n charge of architectural decor" for Blackmail. Graham Cutts is listed as an "independent director." The entry mentions The White Shadow. Hitchcock's entry has the wrong birth year. Waltzes from Vienna and Strauss' Great Waltz are UK and US release titles for the same movie. 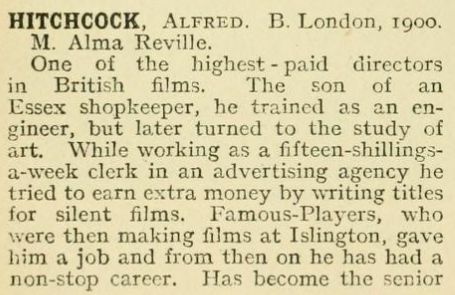 F P Tennyson was assistant director on several Hitchcock movies at Gaumont-British. 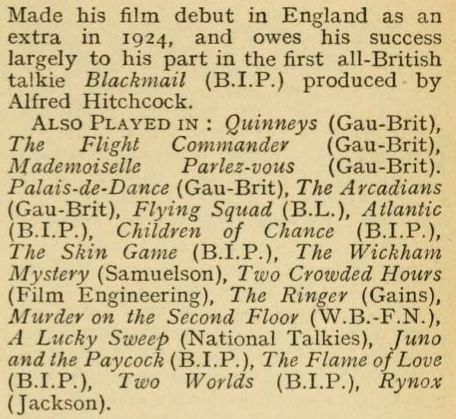 A list og Gaumont-British releases includes The Woman Alone and "Alfred Hitchcock Production (Untitled)." The latter could have been The Girl Was Young/Young and Innocent or The Lady Vanishes. King Solomon's Mines with Paul Robeson and Dr Syn with George Arliss are the only other ones I have heard of. 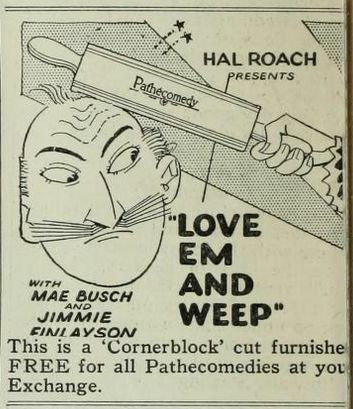 Hitchcock had a small ad in this edition. I like the design. 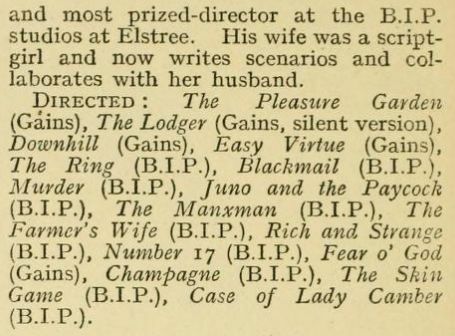 I guess Hidden Power was yet another potential title for Sabotage/The Woman Alone/I Married a Murderer. 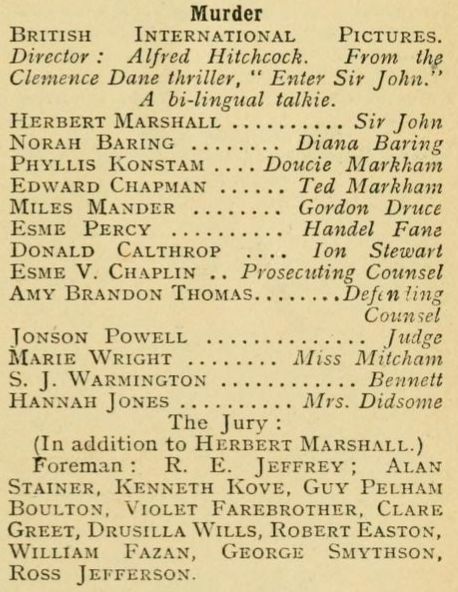 A list of literary properties give the film's release title in the UK, Sabotage. Another item on the list is that "Untitled Original." Several big studios had multi-page ads that ran on every odd-numbered page over a large span. 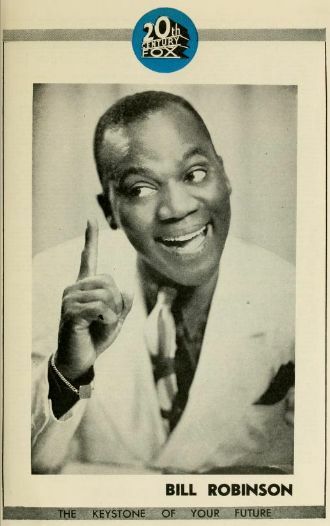 I was happy to see entertainer Bill Robinson featured in 20 Century-Fox's ad. 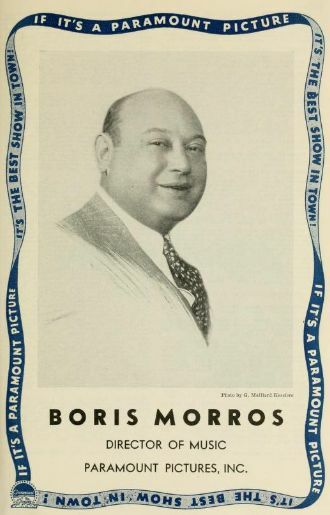 Laurel and Hardy fans will recognize Boris Morros as producer of The Flying Deuces. 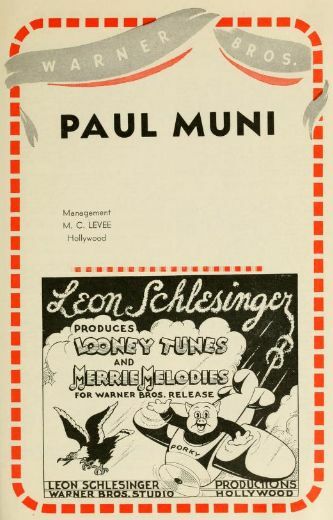 Actor Paul Muni shared a page of the Warner Brothers ad with Porky Pig. 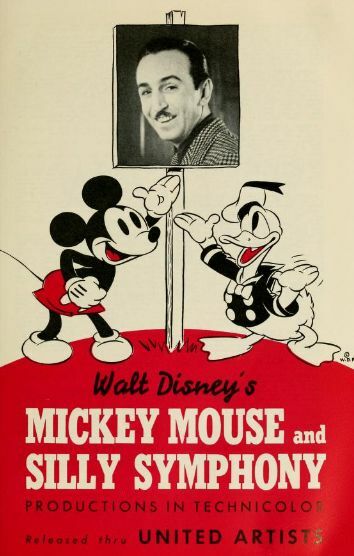 The Disney ad features the boss along with Mickey Mouse and Donald Duck. 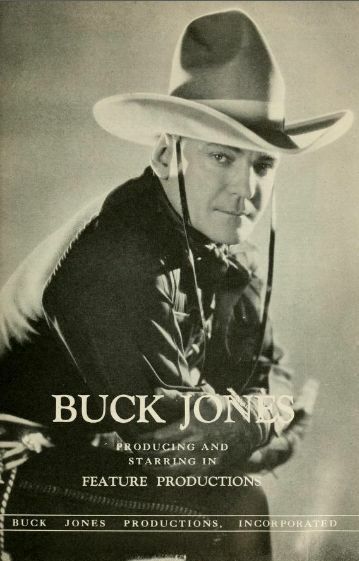 I like the picture of western star Buck Jones. 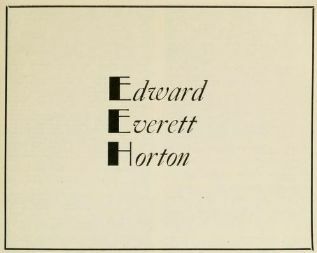 Edward Everett Horton's ad is elegant. An ad for Alliance Films mentions two directed by Graham Cutts, Aren't Men Beasts? and Radio Review of 1937.